Focusrite introduced the original Liquid Channel — a channel strip comprising a convolution-based preamp and dynamics section, and a digital equaliser — back in 2004. It was a revolutionary product, combining the powers of Sintefex's dynamic convolution technology with Focusrite's ability to design fabulously transparent and versatile analogue preamp circuitry. You can read my thoughts on that product in SOS December 2003 (preview) and July 2004 (review): both are available from the Sound On Sound web site at www.soundonsound.com. Following on from that groundbreaking product, Focusrite launched the Liquid Mix 32-channel equaliser and dynamics processor — again based on the dynamic convolution idea. The latest in the line, the Liquid 4 Pre, was introduced at AES New York at the end of 2007, and it revisits the Liquid Channel's core technology to deliver not one, but four channels of convolution-based preamplification in a single box. It is a kind of cross-fertilisation between the classic ISA428 four-channel preamp and the Liquid Channel — in fact, it is even styled to resemble the 428 in some ways. Focusrite claim that this new preamp is "the most flexible four-channel preamp in history," and although I don't go much for the hyperbole they could have a point! First, lets clear up what the Liquid 4 Pre isn't. It is not four Liquid Channels in the same box — there are no dynamics or equalisation facilities here. What is on offer is four mic preamps, plain and simple, with the bonus that the preamps can be individually configured to behave like pretty much any classic or vintage preamp you care to think of, thanks to the Liquid Channel's core technology. The original Liquid Channel's preamp stage was the first of its kind and extraordinarily complex. It involved a lot of sophisticated switching of inductors, capacitors, resistors and even a transformer, to radically alter the impedance and other electrical characteristics of the input stage. The aim was to change the input stage so that, from the microphone's point of view, the input circuitry appeared to be exactly the same as the actual preamp being emulated. The reason is that the performance of most microphones is affected in significant ways by the characteristics of the input it is feeding, and this interaction is a vital part of any preamp's sound character. Furthermore, this interaction cannot be emulated easily using convolution — it has to be at electronic component level in the analogue front end! One problem when designing a multi-channel version is that this preamp circuit's complexity meant it took up a lot of space — almost half the available floor area of the Liquid Channel's rack-mounting case. So getting four of these analogue sections into a 2U case would have been very difficult, not to mention extremely expensive. Fortunately, technology moves on, and the Focusrite boffins have spent the last three years locked away in darkened rooms trying to find a way of reducing the size and complexity of the preamp circuitry without changing the fundamental way in which it works, its flexibility or, most importantly, its performance. The launch of the Liquid 4 Pre is the evidence that they have achieved their goal, and a squint inside the box reveals a far more compact (but still very busy and complex) pair of circuit boards, one mounted above the other. The most obvious circuit change is that the large transformer used in the Liquid Channel has been omitted from the Liquid 4 Pre's input stages completely. However, its influence on the circuit characteristics is still provided by smaller, cheaper components, including bespoke inductors. Apart from the revised input circuitry, the Liquid 4 Pre is essentially the same as the original Liquid Channel, with the same dynamic convolution engine running the same emulation software. 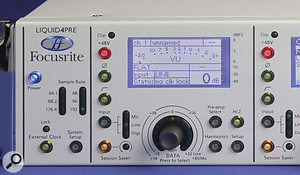 Sintefex's dynamic convolution, which lies at the heart of the Liquid Channel and the Liquid 4 Pre, works by using impulse response measurements taken from real preamps at a series of different amplitudes (all the way from the clipping point down to the noise floor), which together create an accurate acoustic image or 'sample' of the characteristics of the preamp. These characteristics are then imposed on the input signal via a process of convolution. This is a very intensive number-crunching exercise, requiring a very powerful DSP — and with all four channels running at 192kHz, the Liquid 4 Pre DSP is processing 256 million samples per second! Since the Liquid 4 Pre uses the same convolution engine as the Liquid Channel, it has been launched with the identical default factory set of 40 vintage and classic microphone preamplifier emulations. It can also be expanded to use any of the Liquid Channel's additional preamp emulations (25 new emulations were introduced in 2005, and 12 more in 2006). Given the multi-channel nature of the Liquid 4 Pre, the other major difference from the Liquid Channel is in its interfacing facilities. The rear panel accepts mic and line inputs for each of the four channels, all on XLRs, as you would expect. The preamp outputs are provided as both analogue line level on four more XLRs, and as two pairs of AES3 digital on two more XLRs. There is also a single AES3 (stereo) input, on yet another XLR. This input can be accessed by any or all of the preamps, if required. There are also three ADAT lightpipe ports, labelled as Main and Aux outputs plus a 'Slave' input. As usual, elevated sample rates reduce the number of channels available in the ADAT interface, but this will only be a practical issue for rates above 96kHz, when you lose two channels from the interface. The Slave ADAT input is provided to allow the outputs of a second Liquid 4 Pre to be routed through the first, so that the combination of channels can form a full eight-channel ADAT stream (assuming the unit is operating at 44.1kHz or 48kHz sample rates). Even more interesting is a blanking panel over an interface slot for future alternative interface cards. Already listed, but not available for the review, is an (eight-channel) Ethersound card, which will appeal to the live sound fraternity in particular. If the Slave ADAT input is being used, the eight-channel combination can also be routed out via the optional Ethersound card. A little more humdrum in comparison is the pair of BNC connectors for word clock in and out, and an RJ45 socket for Ethernet (100baseT) connection to a computer, for software updates and remote control applications. This interface was chosen instead of USB since it can be used over greater distances and allows simultaneous control of more units — up to 32 devices (providing 128 channels) can be operated using the supplied Liquid 4 Control software. For the sake of completeness, I should also mention the IEC mains inlet with a four-way mains voltage selector (although I was slightly concerned that the labels on the selector didn't match the options listed on the back of the unit itself — but then the review model was an early production unit). The Liquid 4 Pre occupies 2U of rack space, extending 270mm behind its highly polished rack ears. The unit is quite heavy, weighing in at 5.3kg, and although the left-hand side gets noticeably warm around the power supply there are unlikely to be any cooling issues. The front panel mimics, to a degree, the Focusrite ISA428 preamp, thanks mainly to the use of four LCD panels that act as meters (and configuration screens), each with a rotary encoder below. The panel is divided into four identical preamp sections, plus a configuration section at the left-hand side. Neat, illuminated push-buttons are used throughout the panel, along with the four rotary encoders and distinctive grey columns with a trio of LEDs to indicate various modes. Each channel has a decent-sized screen with clear metering and other channel information.Photo: Mike CameronThe leftmost section includes a power button which illuminates blue, along with the 'ff' logo above — very stylish! Two LED columns show which of the six available sample rates (44.1 to 192kHz) is in use. A button below (green) selects the external word clock option, and another green LED indicates whether the external clock is valid (steady) or not (flashing). A third button (that flashes green) accesses the Setup menu, which is displayed on the first channel's LCD screen. Each preamp section has a column of five illuminated buttons to the left of the display, and four more at the bottom, to the right of the encoder knob. The top three buttons in the column switch on phantom power (red), polarity inversion (green), and the high-pass filter (green). The latter has a 12dB/octave slope and turns over at 75Hz (-6dB point). The next button isn't illuminated, but cycles around the available inputs of mic, line or a digital input, this last option being pre-selected via the preamp's setup menu. 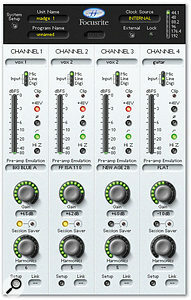 The options are AES (left or right), ADAT (channels 1-8) or option card inputs (1-8). At elevated sample rates the ADAT and option card inputs will only provide four (88.2 and 96 kHz) or two (176.4 and 192 kHz) channels. The selected input is indicated by another trio column of small green LEDs. The bottom button (yellow) activates the Session Saver function, which is carried over from the Liquid Channel. If activated, this essentially resets the preamp's gain setting to a lower value automatically if the input signal reaches 0dBFS. An associated LED illuminates if the Session Saver has been triggered. To the right of the encoder knob is the array of four buttons mentioned earlier. The top-right one (green) forces the input stage to provide the highest available impedance (usually 10kΩ), regardless of the correct impedance for the selected preamp emulation. High-impedance mic inputs are quite fashionable at the moment, and generally result in a brighter, and often slightly stronger, signal. They can also have the effect of reducing resonant peaks in the response of some dynamic mics. We are talking about a subtle creative tonal shaping option here — but a useful one nonetheless. The bottom left button allocates the encoder knob to adjust the Harmonics function, which introduces progressive distortion. 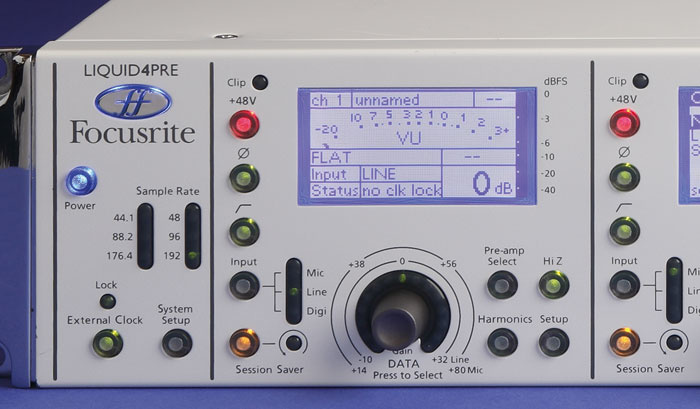 On a technical level, this provides the means to replicate the kind of variability that afflicts ageing vintage preamps, and on a creative level it allows a degree of thickening or dirt to be introduced to beef up the sound character. The amount of harmonic distortion is scaled simply from 0 to 15, and the character varies with the current preamp emulation. However, at the top end of the range the harmonics function adds as much as 10 percent second harmonic, 20 percent third harmonic, and 10 percent of fifth-order distortion (for near peak-level signals). The first half of the scale (below about 8) generally only adds second-order harmonics, while the top half applies much more in the way of odd harmonics — which, intuitively, is what you would expect. The button flashes green when pressed, to remind the user that the encoder is configured to adjust the level of harmonics, and the LED ring around the knob shows the current setting (along with a numerical value in the display). The top-left button configures the encoder knob to scroll through the available preamp emulations, and pressing the knob selects and activates the one currently displayed in the channel's LCD screen. Again, the button flashes green while in this mode. Finally, the bottom-right button accesses the channel's setup menu, which is revealed on the LCD, and the button flashes green once again while this mode is active. I'll come back to this menu in a moment. The encoder knob, when not being used to adjust harmonics or select preamp emulations, adjusts the preamp's gain in 1dB steps, in the usual way. The available gain varies with the selected source, ranging from +14 to +80dB for the mic input, and -10 to +32dB for the line and digital inputs. Once again, the LED ring around the knob indicates the approximate gain setting, while the LCD reveals the precise numeric value. The four display screens are very bright blue-on-white affairs, but they are easy to read at a distance, thanks to their uncluttered layouts. In normal operation the screen is divided into five information areas, with the top line providing the preamp number, a user-defined name, and the current preset memory number (if in use). Below this is a meter display, which is configured globally (from the System Setup menu) either as a peak-reading horizontal bargraph or a VU-style meter — the latter with user-defined calibration for the 0VU mark between 0 and -24dBFS. Supplementing the meter display is a bright red LED above the phantom power button, and this illuminates when digital clipping occurs. The next display line shows the current preamp emulation name and the harmonics level, and below that to the right is a double-height display of the preamp's gain setting. To the left, the two bottom display lines show the selected input source and its status. These really come into their own when the digital input is selected, since the display reveals which of the digital options has been preselected and whether the clocking is correct. It also indicates how much attenuation has been introduced by the Session Saver function (if activated). While this may all sound rather more complicated than your average mic preamp, the basic configuration and operation is actually entirely logical and intuitive. It is not so much complex as extremely flexible and versatile — but easy to use all the same. The only slightly confusing and less-than-intuitive parts of the design are the Channel Setup and main System Setup menus — but, to be fair, the logic of these becomes clear enough after ten minutes of messing around with the unit. The basic functionality is to scroll through the available options listed on the screen, with the encoder knob. Pushing the knob accesses the current function, allowing its value to be changed by turning the knob again. A second press of the knob exits the parameter adjustment mode and allows list scrolling again. Up to 32 Liquid 4 Pre units can be controlled simultaneously using the remote-control software.Photo: Mike CameronThe supplied software provides very comprehensive control of all the preamp's functions and preset memories via an Ethernet link. As mentioned earlier, up to 32 Liquid 4 Pre units can be controlled simultaneously, and the software has been designed to work within your DAW environment. A Pro Tools TDM/RTAS plug-in version also allows integrated remote control via Pro Tools hardware and software, including Icon and Venue systems. The size of the LCD screen means that a maximum of four options can be shown at a time, and most screens only show three parameters, so the majority of screens include a 'More' option, which enables you to access the next page. Some also have a small open box included in the scroll list for each page, in the bottom right-hand corner. Clicking in this box either moves back up to the previous menu page, or exits the menu altogether. Pressing the Setup button on the front panel of the Liquid 4 Pre always exits the menu, regardless of the current page. The Channel System menu comprises just two pages, and starts by allowing the channel preamp to be named (up to 12 characters in upper or lower case, numbers and symbols, such as question marks and exclamation marks), and channel-setting memory presets loaded or saved (99 are available, and can be named). Current preamp settings are stored internally every 10 seconds anyway, so that the unit will power up with the last-used configuration. The second menu page allows the digital input to be pre-selected and a linking bus established. There are four link options (as well as the option to switch off linking), the first two ganging gain-settings directly, and the second two ganging them while maintaining any current level offsets. The first mode is essential for normal stereo mic arrays, for example, while the second is handy for MS pairs and some kinds of surround array. The main System Setup menu is a little more involved, with three pages. The first provides options to set the sample rate and clock source (internal, word clock, ADAT, AES, Ethernet or word clock with a 75Ω termination), and to load or save preset unit memories. There are 99 of these as well, which can store the entire configuration of the machine — all four preamp channel parameters, sample rate and clocking, and so on. As with the channel memories, they can be named, but (strangely) the Load and Save menu functions operate slightly differently from the Channel menu, using an additional screen for naming and selecting them. Usefully, there is also a System menu option to reset the entire machine to a default start-up condition. The second menu page provides functions to disable all front-panel controls (apart from the System Setup and mains power buttons), to configure the unit as a master or slave (in terms of the ADAT channel amalgamation and setting the necessary clocking), and to name the unit for remote-control recognition. The third page allows the LCD meter-type to be determined (digital peak-reading bargraph or VU, as mentioned earlier), the 0VU reference point to be set, and the Ethernet access parameters to be configured (Auto DHCP, or manual with options for IP address, mask and gateway). The Liquid 4 Pre very clearly builds upon the original Liquid Channel — and that unit impressed me enormously, for a number of reasons. The Liquid Channel's analogue preamp stage is quite exceptionally transparent in its 'natural' state, the digital converters are extremely clean and accurate, and the preamp emulations provide phenomenal tonal and creative variations at the touch of a few buttons. In some ways, it is almost irrelevant whether the emulations are truly accurate or not — the fact is that they provide a wealth of creative options to colour and shape the sound in ways that simply aren't available in any other device. But when I was able to make direct A/B comparisons with some of the very units that Focusrite had sampled for the original emulations, I found the Liquid Channel to be astonishingly accurate — and all but indistinguishable when working at the higher sample rates. So it was with some trepidation that I approached the Liquid 4 Pre, knowing that the preamp circuitry had undergone some radical surgery. I was able to get to grips with the Liquid 4 Pre quite extensively over the Christmas period, using it on a variety of small projects, and I have to say that I have become a convert. In terms of native sound quality, I'd put the Liquid 4 Pre on the same level as the Liquid Channel, but it easily surpasses that unit in terms of practicality and versatility for me. Having four preamps in the one box, with very flexible I/O, makes this something quite special. The rear panel includes XLR mic and line inputs for each channel, an Ethernet connection for the remote-control software, and ADAT, AES/EBU and word clock interfacing as standard. The blanking plate takes the place of the optional Ethersound card (unavailable at the time of the review). Photo: Mike CameronI ran it in parallel with my own ISA428, using the analogue outputs, and found it to perform extremely well, being more transparent and less coloured when using the 'flat' emulation. Taking the digital outputs to feed a SADiE LRX2 recorder, I could find nothing to complain about either — the converters are easily as good as those in the ISA428's option card, and probably better. Running the analogue outputs from the Liquid 4 Pre into the spare inputs on the ISA428's digital interface and comparing them with the Liquid 4 Pre's own digital outputs certainly suggested the latter's superiority — although it clearly wasn't a very fair test, given the multiple conversions that were going on! I was also able to compare the accuracy of the emulations against a Focusrite Red 1 preamp, and was reassured to find identical characters. Despite expecting to find weaknesses in the revised preamp design, I certainly didn't become aware of any, and the characteristics I was expecting to hear in the different emulations were all there. And at the end of the day, that's all that matters, really. Not whether it really can sound exactly like a specific vintage Neve preamp, or whatever — but whether it conveys the same musical values and flavours that made the Neve, or the Telefunken, or the Trident, or the API preamps such popular tools in the first place. And it does that absolutely, convincingly and impressively. However, behind the rose-tinted spectacular, there were a few blemishes that irritated, the power-up routine being the worst: it takes about 15 seconds for the machine to 'boot up', during which time all of the illuminated buttons flash on and off at roughly one-second intervals in a garish light show that would put some nightclubs I have known to shame! Talking of light shows, the four LCD screens aren't exactly dim either, and in a typically subdued control-room lighting scheme I found the glare from the Liquid 4 Pre a little too much. It would be nice if the LCD backlights could be adjusted — although I don't know whether that is a practical possibility. The only other niggle for me was one small aspect of the menu navigation. If you name a channel or preset, you have to click through all 12 character positions before being able to exit the parameter mode, which is tedious. But more of a problem is the fact that you have no idea (unless you count as you go) how far through the text box you are as you click away. The inevitable result is that you continually overshoot and can never exit the mode! Click to change the name parameters, click and scroll to set the first letter, click and scroll for the second...and so on until the name is complete. You then click repeatedly to step through the remaining spaces, falling back to the menu option itself. At that point you have to turn the encoder knob to move to the next option, but what tends to happen is that in the frenzy of clicking through the empty characters, you click on the menu option and then go straight back into editing the first character... Doomed to start the process all over again! The display needs some sort of indicator to make it clear when you have reached the end of the text entry box — which is surely only a simple software update away! In reality, frustrating as these issues were initially, they're actually very minor, and familiarity quickly diminished their power to annoy. Overall, I found the Liquid 4 Pre to be a very impressive preamp indeed, and I am sorely tempted to add it to my wish-list, simply because it is so versatile. If you want squeaky-clean and accurate, it can do that. If you want characterful it can do that. If you want dirt and attitude, it can do that too. And if you want to rework something at line level, it can even do that. What's more, you can have all four of those options running simultaneously! The gain-linking options cater for every eventuality I can think of, and the variety of I/O interfacing, plus the ability to chain two units to create an eight-channel stream, is very useful indeed. With the Ethersound option and the ability to remotely control up to 32 units, I can see opportunities for this unit in live sound recording rigs and high-end live sound applications too. OK, the Liquid 4 Pre might seem expensive at first sight, but at roughly £500 per channel it's not that scary when you consider the integral high quality A-D and D-A that is included 'for free' — let alone the unparalleled versatility in sound character. This unit really can be all things to all men. Just make sure you have plenty of space on the credit card if you plan to audition one for yourself! The Liquid 4 Pre is unique — there is nothing else on the market with comparable tonal versatility (other than its single-channel sibling, the Liquid Channel). However, there are many traditional high-quality mic preamps around the same budget level that would warrant consideration. A personal favourite is the Benchmark PRE420, which provides four very high-quality mic preamps with an integral stereo mixer and monitor section. 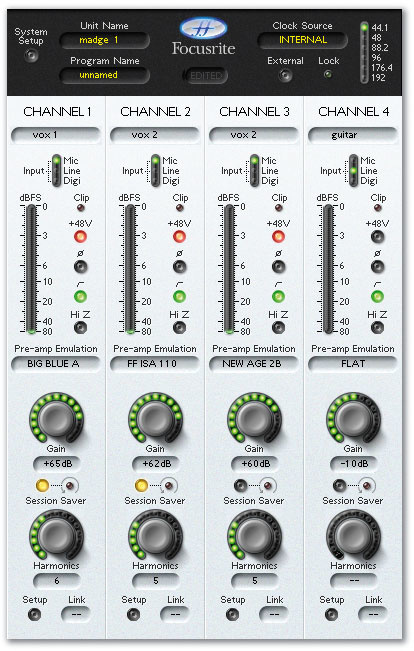 The API 3124+ four-channel preamp costs roughly the same and has a well-deserved high-end reputation, as do the Universal Audio 4110 and the Focusrite Red 1 — all three of which are included in the Liquid 4 Pre emulation library. Priced slightly higher than the Focusrite box, the GML 8304 is a fantastic preamp (it is my own high-end reference), as is the Maselec MMA4 and the Neve 4081 (four classic 1081 preamps in a box — another inclusion in the emulation library). Memory recall of channel parameters, singly or en masse. Versatile and comprehensive analogue and digital I/O. Very clean and transparent native preamp character. Excellent A-D and D-A conversion. Master-slave mode and remote control options. LCD screens can be annoyingly bright in a dim room. Menu operation not as intuitive as the front-panel controls. The Liquid 4 Pre takes the core technology of the original Liquid Channel and redevelops it to form a more versatile, and in many ways more useful four-channel preamp.